The Mono Pleat utilizes a one-piece wrap around chipboard frame. 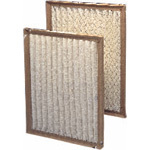 The filter element is mechanically bonded to the frame by a thermal plastic sealant activated by applied heat and pressure. The Mono Pleat is an economical, high capacity medium efficiency filter designed for applications where 1" disposables are effective.